Happy 2019, everyone! Ravnica Allegiance spoilers should be kicking into full gear, so get ready for some more exciting stuff to happen with Magic. We’ve already seen some movement based on what’s been spoiled so far, and I’ll talk about that shortly. We’ve also experienced the normal dip in card prices owing to the holidays. As usual, this is generally a good time to buy cards if you can afford to, because prices will start to rise as the new year rolls in and people get back into the swing of things. Plus, tax season is around the corner and some people spend part of their tax return on things they need or want like Magic cards. As you might know, I’ve been buylisting some cards that have been sitting around unused for years. And I probably should be selling more of my cards or converting them into things like Dual Lands or Power since I don’t play that many tournaments right now, being busy with work and a kid. I did giveaways in article #21 and #23 for people who helped me decide what to do with my store credit I had at Card Kingdom and Star City Games. I was really thinking about getting some Engineered Explosives Inventions or Scalding Tarns. But ultimately, I decided to pick up some Dual Lands instead since they’re on the Reserved List and are highly played in Legacy and EDH/Commander. As I mentioned above, there has a been a dip in some card prices owing to the holidays. So I decided to take this opportunity to pick up Dual Lands now before they start to rise in price again. I also want to note that I should’ve picked up a Tundra instead. But I waited a little too long, and it disappeared when I went back to check if it was in stock. There was also a Badlands in stock when I decided to get the Bayou. And that might’ve been the better pick, but I’m not sure. We had a quick discussion about this in our Office Hours #4 podcast. 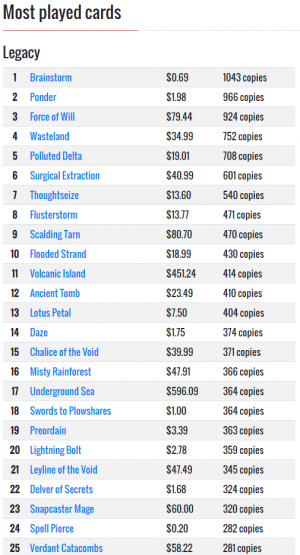 Although Badlands has crept up in price over the last year owing to decks like Grixis Control and Rakdos Reanimator in Legacy, Bayou is played more overall throughout the format. 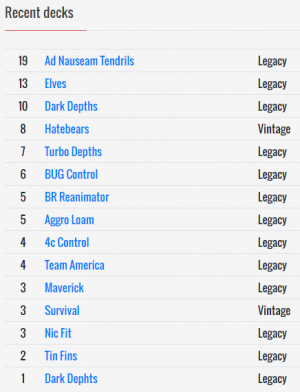 Bayou comes in at 40th place of the most played cards in Legacy, whereas Badlands doesn’t make the list yet. 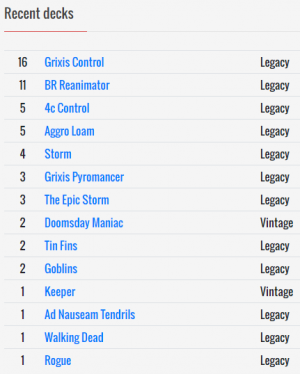 However, Grixis Control is currently the second most popular deck in Legacy right now. Although Bayou is the more popular of the two, Badlands is definitely one to keep an eye on. I used the remainder of my credit to pick up one of the lesser played Dual Lands. It was kind of a toss up between this and Plateau. 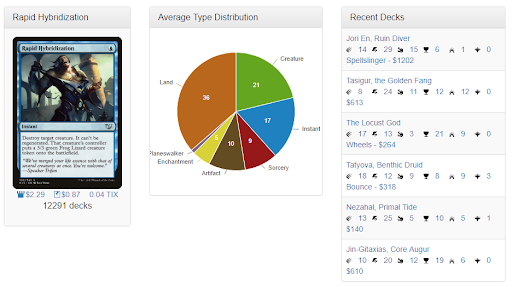 Taiga sees more play than Plateau owing to Lands, which is why it’s slightly more expensive. 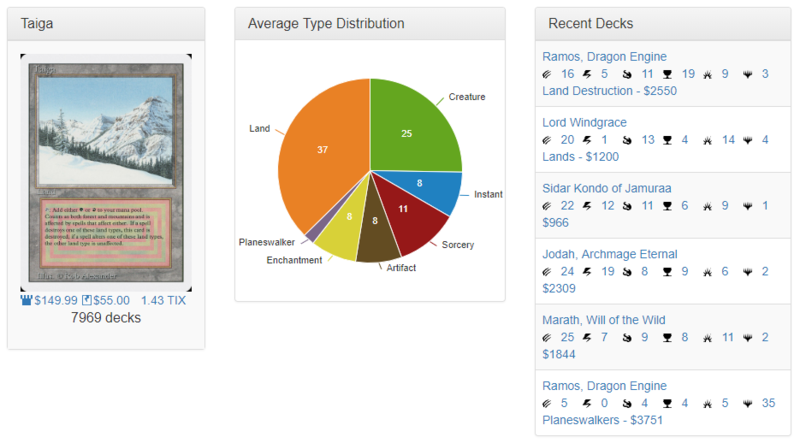 However, Plateau has starting showing up a tiny bit more in Legacy now owing to Death and Taxes. It also shows up in Maverick, but Taiga does too. Previously, Plateau was pretty much unwanted for Legacy. However, it’ll just take one time for a new card to come out and push the need for Plateau. And once that happens, supply will start to shift and possibly dry up a bit since there’s only a finite number of these in the market. 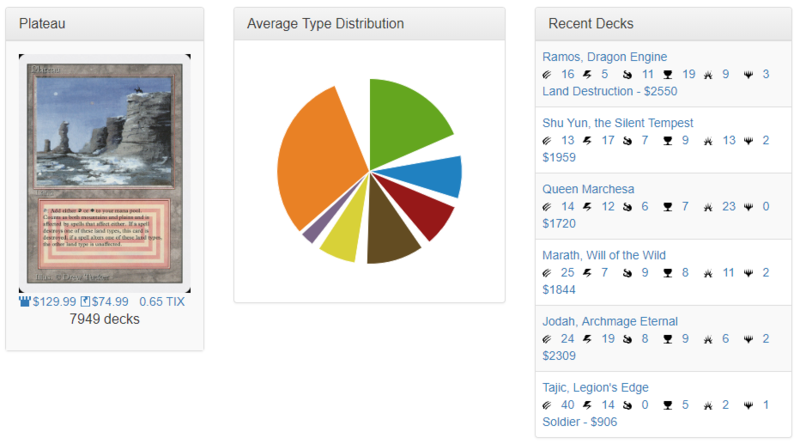 It’s also worth mentioning that both Taiga and Plateau see a decent amount of play in EDH/Commander, showing up in almost 8,000 decks each. I’ve heard that a lot of playgroups allow proxies. However, there are still a good amount of people that want the real cards for their decks. I wasn’t that happy spending almost all of my Star City Games credit on this, even at the holiday sale price. As you can see this was even more expensive than the Taiga at Card Kingdom. But Star City Games is known for higher prices than most stores. I wanted to get another Taiga but the one they had was a bit more expensive than the amount of credit I had, so I went with this. Plus, I got to diversify my portfolio a little bit. I’d like to also mention that the Taiga and Plateau were listed in excellent and played condition respectively. 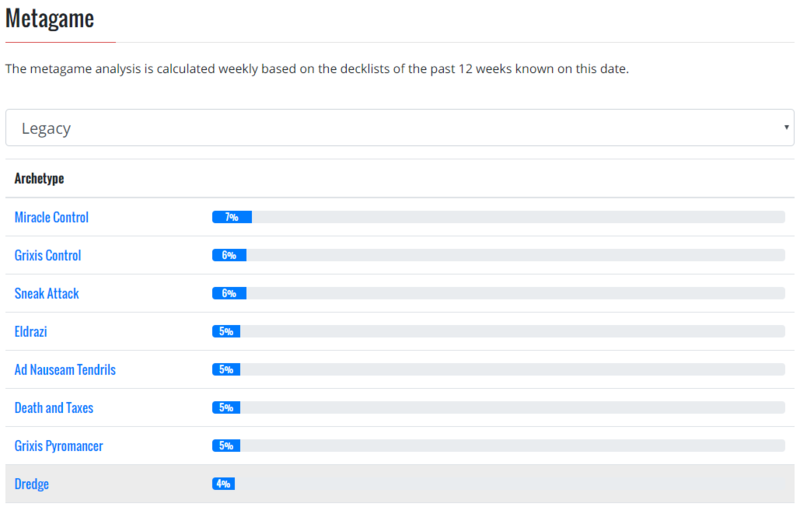 However, Card Kingdom and Star City Games are both known for being pretty strict on their grading. So the cards I received we’re in good shape and probably could pass as higher graded cards. Overall, I can’t be too disappointed that I converted some of my cards that I didn’t need into Dual Lands that will never be printed again. I mentioned in article #21 that if you can get this under $3, it might be worth it. So I stuck to my word and picked up a playset in case I want to play Pauper some day. And it really has been popping up as predicted. The top four decks of Magic Online’s Pauper Challenge posted on December 24 all played three copies in the maindeck. I was a little late to the party with this one. But I found a decent price on a playset, so I picked it up. This has been trending up owing to the aforementioned Rakdos Reanimator in Legacy. 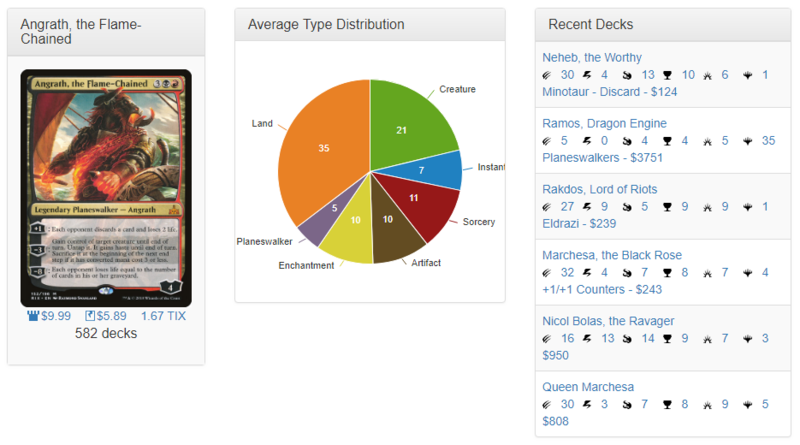 That deck has also contributed to the recent Griselbrand spike, a card I mentioned a while back in article #2. 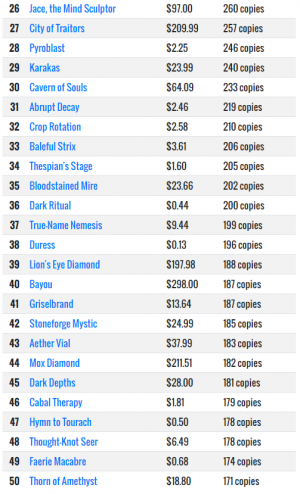 And although Pascal didn’t run Exhume in his list, the third place list did. And don’t forget about the Snow-Covered lands I mentioned in article #9. This is probably a little too much for foil versions of this card. But if you can get them under $3, that might be a good price. I’m not sure if this will see play in Standard, but time and testing will tell. However, this will most likely replace Commune with Nature in Modern’s GWx Vizier decks, as it’s pretty much a strict upgrade. And although this is a blue card that can be used with Force of Will, it’s most likely unplayable in Legacy since neither Commune with Nature nor Rapid Hybridization see play in the format. It could show up in EDH/Commander though, so keep an eye out for that. The real reason the Griselbrand spike mentioned above happened was because Through the Breach, Nourishing Shoal, and Goryo’s Vengeance were all reprinted in Ultimate Masters—and Worldspine Wurm wasn’t. This is the only printing of the card, so it could definitely use a reprint. I don’t know when that will happen though, since Ultimate Masters is supposed to be the last Masters set. I guess it could be reprinted in a supplemental or Core set. If that does happen, the price of this card will probably tank since it only shows up in Modern’s Grishoalbrand and Sneak Red in Legacy. So if you’re not using these, I would lock in your value now. I’m not sure who’s still buying this card at that price, but it’s pretty crazy. If you have these, I would sell into the hype. There will be a ton of copies flooding the market from Ravnica Allegiance which will eventually cause the price of the original version to drop. 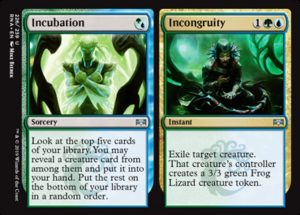 Invasion foils, however, will probably maintain a premium since there’s quite a bit less supply in the market. This will most likely see play in Standard alongside Teferi, Hero of Dominaria, Glacial Fortress, and Hallowed Fountain. I’m less sure if it will make the cut in Modern—three mana is a lot. And there’s already so many different counterspells fighting for the two-mana slot. This has spiked hard because of speculation that Rakdos will be powerful in Standard once Ravnica Allegiance becomes legal. People are hyped about the spectacle mechanic and cards like Bedevil. It’s definitely nice that Angrath’s first ability helps trigger spectacle, but we just don’t have enough information right now to know if Rakdos will be a top-tier deck. Definitely sell into the hype if you’ve been sitting on any of these. This will most likely never see play outside of Standard. And it only sees play in just over 500 decks in EDH/Commander. This has been a staple in Modern and Pauper for many years and has begun to slowly creep back up in price in the past year. If you don’t have your playset, now is probably a good time to get them and hold onto them.